Just what I was looking for at a very good price. I had previously bought this individually from a local store. This was much more economical. Will be purchasing more in the future. They hold twice what the qt jars hold. Highly recommend. 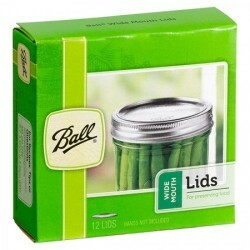 Great for freeze dried vegetables so you can see what's inside and no contamination with glass. A very fair price and it shipped early. The packaging is a work of pure art, giving maximum protection to the product. I strongly recommend that anyone interested in these jars buy from this vendor. Nice jars. I am simplifying my life by using mason jars for pretty much everything. Storage, fermentation,glasswear. Good price, holds a lot, used constantly, holding up great! LOVE this size jars for things I dehydrated and I can vacuum seal them with my FoodSaver. You can see what is in them easily in your cabinet or pantry. NOT for use to can foods in, pressure or water bath methods but work great with the sealers. Just love the ball mason jars. They are so stylish. I use them in the pantry and the fridge. I ordered an array of products and am pleased with them all. I would be happy to order with OzFarners in future. There was one lid missing from the box of plastic jar lids but that’s not major. Great product. Great price. Seal perfectly and have a nice vintage charm to them! Really great jars for long term hop storage. Easy process to buy and fast delivery! Excellent product, excellent service, and fast delivery. Great Solid Glass Jars with nice decoration, I only wished that they came in a bigger size. 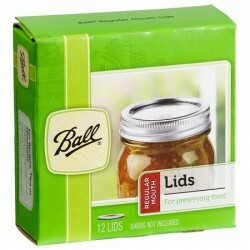 Ball Wide Mouth Half Gallon (2 Litre) Glass Preserving Jars are ideal for fresh preserving apple and grape juices. * Hand wash lids only. Do not put in dishwasher. Dry thoroughly immediately after use to avoid corrosion. * For fresh preserving, follow a tested preserving recipe such as those found in the Ball Blue Book Guide to Preserving.